For many, working in the music and entertainment industry is career path of dreams. With options in publicity, management, performance and more, discovering clarity and finding a way to get your foot in the door can be a difficult task for those unsure of where to navigate. For Katy Richards, the Head of Industry and Scholarship and Entertainment Management teacher, her wealth of industry experience is one that has grown alongside her in the music industry. Aside from teaching Entertainment Management at Collarts, Katy is recognised in the industry for her hard work as the owner and operator of Ground Control Event Services. Taking care of touring logistics for huge international acts, Katy has worked with acts including Coldplay, Adele, Beyonce, Bluesfest sideshows, and much more. Asking Katy for advice, here are the first steps you can take in building a sustainable and passionate career in the music industry. Volunteering at festivals or events is a very easy way to get experience. Make sure you let the volunteer coordinator know that you are interested in entering the industry or if you have other event experience, as you may get a position with more responsibility. The more experience you have the better. Volunteering is a great way to build up your skills and your networks. It’s not uncommon to volunteer at a festival one year and have a paid job at the same festival the next. Be keen, do a great job and doors will open for you. Be the person people want to work with. Event, festival and concert organisers surround themselves with people that they want to work with. You are unlikely to find these opportunities on job-search websites. The more you can build up your network, the more people there are in your world to offer you work. Don’t act like a fan. We all enter the music business because we are fans of music, but if you get the chance to work with some of the artists that you love, you have to keep it together. Acting like a fan when you are working a show is the best way to exit the industry. 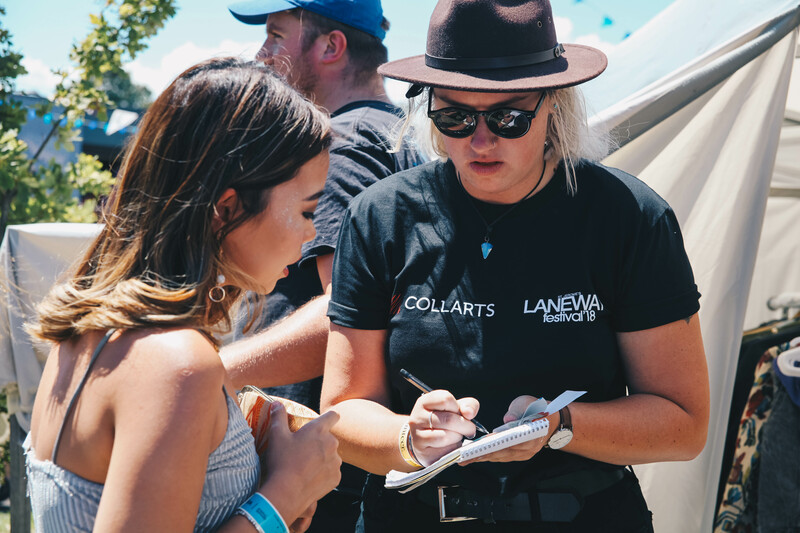 Our Entertainment Management students getting hands-on with Laneway Festival through exclusive volunteer opportunities. Think outside of the square. 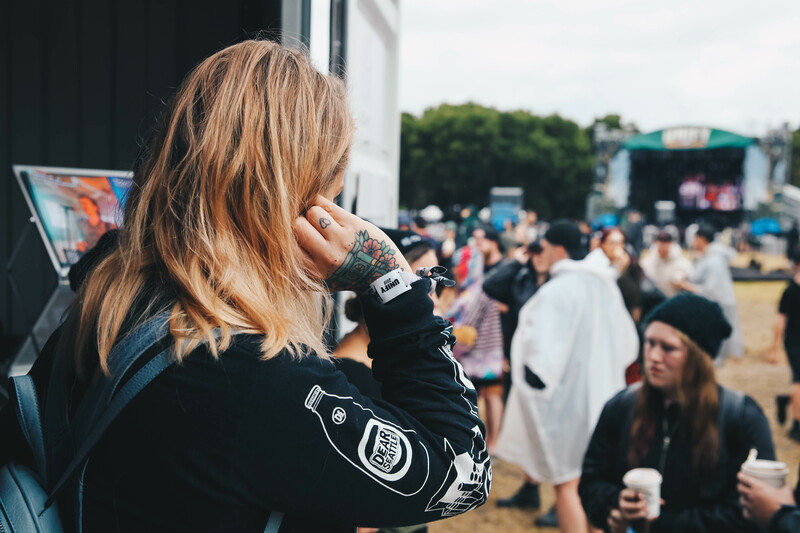 There are so many ways you can get paid work at events – from companies that hire loaders to load gear in and out of venues, to AV hire companies and ticketing. These jobs will give you insight into how shows, however big or small, come together and will help build your network. You are likely to work as a freelancer so learn some basic business skills: get yourself an ABN, write invoices, manage your taxes, and take care of your super. This is all boring stuff, but when you freelance you are managing your own business. In fact, get several. Think about who you would like to mentor you and ask them. After all, what do you have to lose? They may just say yes. They may just even provide you with opportunities. Offer to take them out for a meal or coffee and make sure that you have questions prepared. Studying is not only a great way to learn about the industry but the teachers are often working in the industry and can provide opportunities that are hard to find on your own when you are starting out. Don’t turn down work just because it’s not the music or type of work you are into. Any experience will expand you as a person and worker and will lead you towards your career goal. Once you are established in the industry you can be more particular about what you do. Hard work and integrity will get you everywhere. If you are willing to work hard and long hours, be flexible and pleasant to work with, you will make it in the business. Always go above and beyond and be efficient. Remember you are only as good as your last gig so do it well. This article was originally posted in Beat Magazine and has been edited for reading purposes. Passionate about getting real experience out of your studies and becoming an expert in the industry? Check out our course in Entertainment Management or come along to our next Open Day. Applications for 2018 are now open!